Students, day 8 - Alon Bat Karé to South Africa! During the day we drove for three hours in the KrugerPark. We were very lucky because we saw three lions and a cheetah. 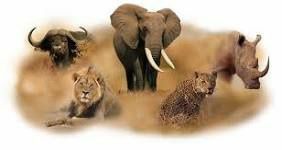 We can now say that we have seen the BIG FIVE!!! We also saw more elephants, giraffes, Hippos, rhinos and crocodiles. The weather was sunny. We had lunch at Lower Sabie camp. Then we got out of the park and we drove to White River. We arrived in the family at 7:30 pm.